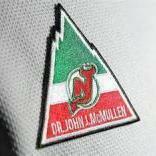 The NEW JERSEY Devils- back!! I thought something was up when MadDog called them the New Jersey Devils in the title. Dano just said Grabner has a “tremendous stick” and I was half paying attention and it sounded like something else. This is a double header day for me. I'm at this game and then have the Red Bulls game at 7:30, anyone else doing both? The teams really should come up with a combo package for days like today. $40/50 gets you a ticket to both games, something like that. Good Start as usual, also great screen. Here in the loft...fair amount of empty seats in this area. Kinda my “goodbye” to the Devils this year. Really good crowd today. All the 1pm Saturday games have been great this year. Our fan base gets a lot of sh&#33;t for our attendance but considering how bad this team has been this year the crowds have been solid all season. Not surprising cause unless you get a cheaper deal like I'm sure you did I don't see a lot of people throwing down face value to sit there. Glad they get to watch an actual NHL roster today. nico at intermission looks 5 years older, beard and pimples .. is he finally going thru puberty??? or roiding it up?? whats up with McLeod and the hunchback stride?? I hate the SO but that one was pretty entertaining. Great game, nice win. LOL @ that guy in the yellow shirt behind the net!!! One win down, one win to go. Nice to see them win in front of a big crowd. Yeah Devils definitely looked better than their offensive output would lead one to believe...having so many guys back clearly made a huge difference, especially on the power play...they simply didn’t convert. And yeah, nice win for Mac. He deserved it. And as SH alluded to, nice-sized crowd...a lot of late arrivers to the loft...was considerably more crowded in the second period than the first. I’d rather he not waste space at Bingo either...he’s a decent AHLer, but I don’t ever want to see him called up to the big club here again...there’s nothing there. It was opposite day for me, saw the Devils beat a team that they shouldn't have and the Red Bulls lose to a team they shouldn't have.